The new sounds and dragonflies enhance gameplay in the Bitter Coast region. 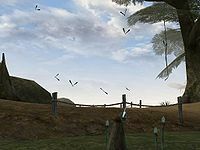 Bitter Coast Sounds adds ambient noise and dragonflies all over the Bitter Coast region. It does not affect gameplay in any way, but merely makes the environment seem more swamp-like. The dragonflies added by this plugin are physical objects, not effects, and as such they have collision boxes. It is not recommended that you jump into a group of dragonflies, as you may find it hard to get out. "Let the gentle chorus of swamp wildlife draw you further into the mire throughout the entire swampy region of the Bitter Coast. You'll find dragonfly creatures now inhabit the muck ponds along the coast. This page was last modified on 19 October 2018, at 21:17.